The Autism epidemic is found in all countries that have allowed mass vaccinations. It is found nowhere else. “Mercury has also the unfortunate ability to transfer from pregnant woman to their unborn babies. According to the Environmental Protection Agency, mercury passed on to the fetus during pregnancy may have lasting consequences, including memory impairment, diminished language skills and other cognitive complications.” Dumbing Down Society Mercury in Foods and Vaccines, Note for decades they told us NOT to "vaccinate" pregnant women for just this reason. What has changed? "There are over one million children and adults with autism and the numbers continue to grow. This is a medical disaster of monumental proportions. The link to the vaccine program is scientifically and logically compelling. One of the strongest links to this terrible set of disorders was a drastic change in the vaccine programs of the United States and many other countries, which included a dramatic increase in the number of vaccines being given at a very early age. No other explanation has been forthcoming from the medical elite." "In this paper I shall present evidence, some of which has not been adequately discussed, that provides strong evidence for a connection between excessive vaccination and neurodevelopmental disorders. In a paper I wrote in 2003, I stated that removing the mercury from vaccines would help relieve the problem, but it would not eliminate it. This was based on a number of studies in the neuroscience literature that indicated that excessive and especially repeated immune stimulation could result in severe disruption of brain development and even neurodegeneration." "The average child receiving all of the recommended vaccines will have some 23 inoculations by age two years and 36 by the time they enter school. Most of these will be spaced within one month of each other, which means the priming and activation cycle of the microglia will be continuous. In addition, should they follow the new CDC recommendation, they will receive the flu vaccine every year starting at age 6 month through age 18 years. These vaccines contain a full dose of thimerosal mercury." The Danger of Excessive Vaccination During Brain Development: The Case for a Link to Autism Spectrum Disorders Russell L. Blaylock, M.D. Note all the above figures are way too low as the CDC mandated "vaccinations" increase every year. There are over 200 new "vaccines" in the pipeline. Big Pharma has based its future on a vastly expanding "vaccine" market. This is one reason your child has a high and increasing risk of Autism. Banned Wakefield Films From British TV Emerge on Youtube After Nearly a Decade this is an excellent video drama of the MMR Facts. One can certainly see why it was banned in Britain. ALL "vaccines" contain mercury. 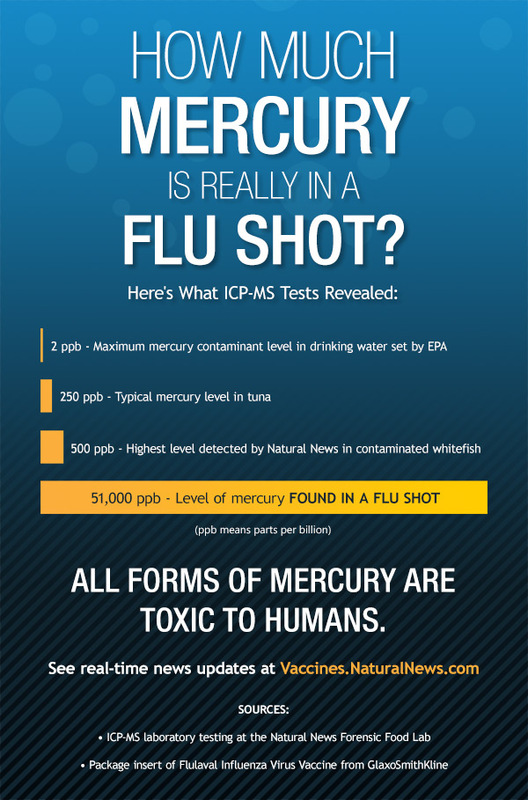 The average "mercury free vaccine" contains about 200 to 400 nanograms of mercury. Mercury is used in the "vaccine" manufacturing process so even if they do not add mercury as an ingredient to the "vaccine" some mercury will end up in the "vaccine". If anyone gives you a hard time about this just ask them for a quantitative analysis to the nanogram level of the vaccine. We thus see how the autism spectrum works. With a little mercury you may get ADD; add a little more mercury and you may get ADHD; add a little more mercury and you may get autism. Please get the mercury and "vaccinations" the hell out of you and your children's lives. So now it appears that something besides mercury, aluminum and all the other toxins injected into our children may be in those "vaccination" needles. Of course I don't not KNOW this but considering that "vaccination" confers more risk than benefit it is certainly yet another reason to STOP VACCINATING. With a serious case of autism you may want to be tested for mycoplasma. Since several serious immune related diseases and autoimmune diseases are known to be associated with mycoplasma please get tested first thing for mycoplasma if you suffer from any serious immune, immune related or autoimmune problems. This is not easy to do as the US Government wants you to believe bio-weaponized mycoplasma does not exist. When you eat a diet of mostly processed food, you are eating largely GMO Soybeans, GMO Corn, GMO sugar, This is Proven to produce GUT INFLAMMATION, LEAKY GUT and MANY other problems associated with ASD. Please view the videos below to see how insane this is. Please visit the Sugar and Disease Protocol to learn how to limit autism by stopping or limiting SUGAR found in table SUGAR other SUGARS and simple carbs. The nation wide incidence of ASD has gone from about 1 in 10,000 of our children in 1980, to about 1 in 68 today; 1 in 38 if you have a boy. The numbers demonstrate that the autism epidemic is not confined to one area of the country, but rather is occurring everywhere in the US. On the state average, there was a 714% increase between 1993 and 2002. Something or things we are doing now and were not doing then is the culprit(s). IMO large amounts of vitamin D and sunshine will help with autism both before and after birth. The vaccination for measles and all the other usually harmless, immuno-salubrious, childhood diseases IMO is best avoided. IMO ALL of the vaccination of healthy children is unnecessary and harmful to the child. IMO the truth is so simple it is impossible not to see it if we but open our eyes. "Non-vaccinated children get Autism Spectrum Disorder at a rate of less than one in 10,000; vaccinated children get ASD at a rate of one in 38 boys." These are our children we OWE them a little investigation and a LOT of firm resolve. Making sure your in utero fetus, newborn, infant and children are fully repleated with zinc is IMO a very important parental duty; especially in this era of more or less forced "vaccination". The link of deficient zinc and Autism and "vaccination" damage is very strong IMO. Perhaps the best news is that your son/daughter still exists intact under the man made fog of Autism. It appears often nothing has been irretrievably harmed. Learn EXACTLY what Autism is and it is often possible to remove ALL or MOST vestiges of Autism and retrieve your beloved offspring intact. Is it easy NO! "Vaccinating millions of children with the hepatitis B vaccine at birth can only be described as dangerous idiocy. The vast majority of infants, children and adolescents are in no danger from this infection- even the medical authorities agree on that. It is also known that the effectiveness of the vaccine in children last no more than two years and has little or no effectiveness in the immune suppressed child. 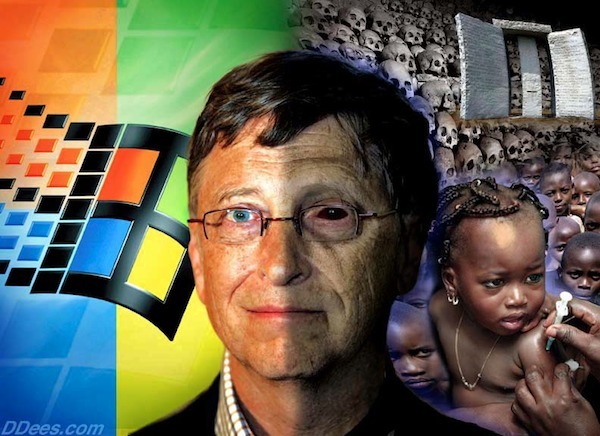 The nefarious plan by these vaccine geniuses is to force vaccines into all babies, since they would have difficulty convincing adults, that is, the one at any danger, to get the vaccine." The Danger of Excessive Vaccination During Brain Development: The Case for a Link to Autism Spectrum Disorders Russell L. Blaylock, M.D. Doctor Mark Hyman has made a breakthrough in holistic medicine. Here is a main stream physician who started out treating complex problems of the body and discovered that when he was able to cure his patients body VERY OFTEN their often broken brains healed as well. His book "The Ultra Mind Solution" is required reading for the inspiration, knowledge, testing, protocols and hope it will bring to your understanding of autism. The Spectrum of Children's "Developmental Diseases"
Mainstream medicine is at last awakening to the extreme importance of vitamin D for heart health. It may take many years for this to filter down to your doc. Please don’t be behind this vital curve. IMO the extreme importance of vitamin D applies to almost each and every one of your bodies systems, including all issues of your brain, just as it does for cardiovascular health. There is much evidence that vitamin D is VERY important in autism please investigate it. A wonderful dialog between a mother of an autistic child and Doctor Cannell MD; You WILL learn MUCH about Autism and how to help your autistic child by following this dialogue. As you can see Doctor John Cannell has done MUCH excellent and results producing work on autism. Please avail yourself of this insightful work. “Only 1% to 13% of infants under 1 year now get a vitamin D supplement, available in inexpensive drops, according to a study published online today in Pediatrics. Those drops are needed, the study says, because only 5% to 37% of American infants met the standard for vitamin D set by the American Academy of Pediatrics in 2008: 400 international units a day.” Life Extension, Note 400 IU MAY be enough for a 10 pound infant but NOT a 20 pound infant. I would definitely take my baby in the sun for HOURS when he developed a tan. For god's sake please do not HIDE your infant from the sun. If you spend some time examining the above information you will KNOW vitamin D is absolutely essential for fetal development. You will KNOW the pitiful 600 or 800 IU of vitamin D your ped has you taking is PITIFULLY LOW. Would you call your ped PITIFULLY. I would; here is a man that is supposed to be a professional; he is supposed to know all about gestational requirements and yet he allows you and your fetus to proceed through all nine months of your pregnancy severly vitamin D deficient. Remember if you are vitamin D deficient at birth you will not have ANY vitamin D in your milk. how is your newborn to get ANY vitamin D? Your newborn will be trying to develop without the critical vitamin D REQUIRED to develop. Once your child is born this "doctor" may then proceed to allow your newborn to remain vitamin D deficient. I would not fight with my "doctor" I would take the responsibility to get my vitamin D 25(OH)D blood levels to 60 ng/ml. How could a man in the business of helping women through pregnancy not know all this? How could the CDC not know all this? The CDC KNOWS, those at the highest political levels want your child vitamin D deficient. YOUR "doctor" goes along with this carnage because he must follow "CDC Recommendations". There is NO other explanation. IV vitamin C therapy was designed for serious problems like Autism. Please explore it. "Doctor Thomas Levy, who has provided the definitive proof in his book ‘ Vitamin C, Infectious Diseases and Toxins: Curing the Incurable’. He is one of the world’s experts in effects of vitamin C on viruses. Here’s what he says “I have not found any flu virus for which vitamin C does not exert a virucidal effect, as long as enough vitamin C reaches the virus, such as in any acute infection. Vitamin C is virtually devoid of negative side effects.” Patrick Holford Note the vitamin C may well destroy the MMR induced measles virus. IV vitamin C is probably called for here. “Eventually I found that provided I could treat an infant early enough I could reverse the unexplained shock or unconscious stage by administering vitamin C in big doses, intramuscularly or intravenously. The method of administration and the dose given depended on the severity of the clinical state. It was a dramatic breakthrough. The statistics demonstrate clearly how I was able to reduce the infant death rate during the period from December 1967 to November 1975 when I left the area. With such a result one would expect other doctors to sit up and take notice. I was shocked to find that the reverse occurred. Doctors and authorities (and later SIDS organizations) not only ignored my work but became extremely hostile. Several times I was able to demonstrate to colleagues the dramatic reversal of the shock or unconscious stage. They remained hostile.” Doctor Archie Kalokerinos MD, Note here is some IMPORTANT information if you are FORCED to "vaccinate" If your baby is to undergo the "vaccination needle" please make sure they get GRAMS of vitamin C before and after the "vaccination"
Besides protecting your child from SIDS and other "vaccination damage", vitamin C may just help with Autism. "Now, limited clinical evidence raises the intriguing possibility that the KD might be helpful to alleviate some of the abnormal behaviors seen in children with autism spectrum disorders." Please read the above paper to see how the Ketogenic Diet can help treat Autism. US Government concedes that mercury causes Autism. Please note mercury a potent neurotoxin is just one of the problems with vaccination, as Doctor Rebecca Carley MD , Doctor Andrew Moulden MD , Doctor Russell Blaylock MD and many others state it is the nature of vaccination itself that is the big problem. Vaccination will not be safe even if ALL mercury is removed from ALL of them. Vaccination IMO is unproven witchcraft accepted uncritically by all too many mothers. I am hopeful because I sense those good mothers are awakening to the evil of vaccination. I pity those culpable. The wrath of tens of millions of mothers is a force to reckon with. One in about 68 of our young VACCINATED boys is AUTISTIC. Less than one fully UNvaccinated boy in 30,000 is autistic. One VACCINATED boy in 38 has Autism Spectrum Disease, ADD, ADHD ect. Less than one fully UNvaccinated child in 10,000 has ASD. Japan banned the deadly MMR "vaccine" wisely in 1992. Per capita for every TWO VACCINATED children that DIE one fully UNvaccinated child dies. So the net result of "vaccination" is a bountiful harvest of Autism, ASD, asthma, Neurodegenerative Disease and death. A little more "progress" like this and we as a society are done. Finishing us off IMO is the whole point of "vaccination". Clearly "vaccination" has not improved the health of our children. IMO by weakening their immune systems and inducing auto-immune diseases, it is setting them up for the coming political pandemic. We know there is almost always a strong connection between the digestive system and the brain in MANY diseases that manifest most overtly as "brain problems". IMO always closely examine the digestion status of the victim. Especially examine and at least temporally eliminate KNOWN digestive health problems. Four foods MANY people are allergic to and often have great results when they simply stop all ingestion are 1) Sugar 2) Dairy and 3) Gluten found mostly in 4) Wheat. If you are having any immune, auto-immune, autism or allergy problems IMO you MUST cease eating these four as a part of your solution. The odds are well over 75% one or more of them are at least part of your problem. There should be little doubt that "vaccination" causes SIDS. IBD is demonstrated to be STRONGLY associated with autism and the MMR. "Vaccination" confers no or little real benefits and LOTS of risks. So tell me once again WHY are we "vaccinating"? Every course of Anti-biotic drugs, often required as a result of "vaccination", wipes out the infant's beneficial gut flora, allow the pathogenic gut flora to proliferate and greatly reduces infants ability to get rid of mercury and other toxins. Poor gut flora is a big factor in autism and anti-biotics are proven to destroy good gut flora. I doubt very much if the "Pertussis Vaccination" has helped ANYONE. Please check out this poison. Mercury is found in many vaccines even many of the so called “Mercury Free Vaccines”. If the vaccination contains less than one microgram of mercury the manufacturer can call his mercury an “impurity” and not explicitly list it. Our most knowledgeable brain specialists have stated that mercury even in doses as low as 1/100 of a microgram is very harmful to the brain of a fetus or small child. We are only fooling ourselves if we think we can continue the flawed and deadly practice of vaccination and to pump ever more mercury and chemical toxins into the unprotected brains (See Blood Brain Barrier Protection Protocol) of our fetuses and babies and ignore their ever increasing rates of Autism and lots of other neurodegenerative problems (See ADHD Protection Protocol) we are seeing. Most “Flu Shots” contain about 25 mcg of mercury. This is about 250 times the EPA’s safety limit for mercury for your six month old infant. Why are we as a nation injecting many hundreds of pounds of the proven neurodegenerative, at the nanomolar level, mercury into the small bodies of our unprotected infants? I believe I know the answer. You may soon too. Please don’t fail to learn it just because it is extremely odious. Of course we are not certain of what besides vaccination is a cause(s) of autism. Doctor Hyman and many others believe autism has MANY causes. I would attempt to get my fetus or infant as “clean” as possible by removing any POSSIBLE cause. Autistic children have improved very much with detoxification of "vaccines", heavy metals and the other toxins of modern life. “The new Rhogam on the market contains aluminum instead of mercury and I will cover that aspect more later on. And trust me, the results are not any better. Those measurements were taken after people have caught on that when mercury was replaced with mercury-based preservative thimerosal it was only a cosmetic “solution”. … There is a frozen version of Rhogam on the market which contains neither mercury nor aluminum, but take a guess whether hospitals will offer it to you or you have to fight a major battle to get it?” Is Mercury Poisoning Through Rhogam the Cause for the Autism Epidemic in the U.S.? IMO if you are an rh-negative woman you MUST come up to speed on this. 53% of autistic children have rh-negative mothers while only 10% of mothers are rh-negative. Clearly being an rh-negative mother is a BIG factor in autism. In particular please research the Rho-GAM injection your doctor will want to inject into you and your fetus at about 28 weeks into your pregnancy. Remember ANYTHING injected into you is within your fetus in minutes. This is one reason a pregnant woman should NOT under any circumstances have her fetus exposed to a "Seasonal Flu Shot" which will contain mercury no matter what the label tells you..
A mercury-free, aluminum-free Rho-GAM exists but the Medical Industry and your doctor will NOT want to give it to you. You must learn how to get it. You do not want to pump mercury and aluminum into your fetus. In Europe they do not give rh-negative mothers the Rho-GAM or its equivalent until AFTER the birth of your first child. This seems to make more sense to me but please research it. IMO there is NO question that vitamin D deficiency plays an important part in MANY cases of autism, as it does in MANY other diseases. It costs almost nothing to eliminate this possibility; the payoffs are CERTAIN if not certain for your son's autism. According to Doctor Russell Blaylock, low magnesium is associated with dramatic increases in free radical generation as well as glutathione depletion and this is vital since glutathione is one of the few common antioxidant molecules known to neutralize mercury. Thus, sadly, children receiving mercury and other toxin containing vaccines are sitting ducks for mercury and other toxins when both their magnesium and glutathione levels are low. When dealing with autism spectrum and other neurological disorders in children it is important to know the signs of deficient magnesium: restlessness, can't keep still, body rocking, grinding teeth, hiccups, noise sensitive, poor attention span, poor concentration, irritable, aggressive, ready to explode, easily stressed. When it comes to autistic children today we need to assume significant magnesium deficiency for multiple reasons. “Researchers examined the brains of 11 autistic patients and found widespread activation of the brain’s immune system as well as inflammation. Of course, experts have long known that mercury, live viruses and aluminum can all stimulate chronic activation of the brain’s immune cells (microglia), leading to inflammation of the brain and excitotoxicity. Analysis from the esteemed Dr. V.K. Singh found that autistic children demonstrated a significant increase in a specific MMR antibody not seen in normal vaccinated children. We know the proof is there, yet the vaccine proponents and the media continue to deny the obvious.” Autism: The Silent Enemy Doctor Russell Blaylock MD . Note this is an EXCELLENT treatise on many "vaccine" issues. You NEED to read it!